A lightly mineralised carbohydrate supplement providing an immediate energy source. Particularly beneficial to dairy cows and sheep. Administrate as a drench in the drinking water or feed. Contains 80% propylene glycol, 0.14% potassium iodine and 0.02% cobalt. 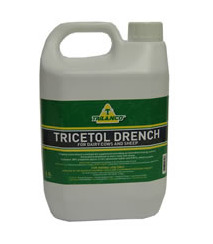 There are currently no questions for Trilanco Tricetol Drench - be the first to ask one!